Travel back to the Wild West and become a sheriff to bring law and order to the untamed land. Click here to play! Capture criminals and befriend the Native Americans for a chance to stake out your homestead and start bringing in some major cash! If you want to make a go of it in the Wild West, you'll need to bring some law and order to the land. The sheriff's badge acts as a wild symbol and will replace all other symbols, excluding the scatters and bonuses, to help you create more winning combinations. Your six shooters are also a valuable commodity in this unpredictable town. Spin one to five of these blazing guns and you'll get up to 10000 times your original bet. 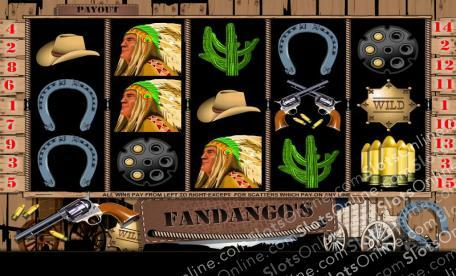 Two to five chiefs will get you up to 800 times your bet, and your gun chamber will get you up to 100 times your bet. Some other symbols to watch out for include cowboy hats, boots, cacti, horseshoes and bullets. Be sure to watch out for TNT! This explosive symbol acts as a scatter and will reward you with a number of free spins if you spin three or more anywhere on the board. Like all lawmen, you'll need to capture your criminals, so keep a close watch on the wanted posters. Three of these on selected reels will trigger a bonus game that sees you shooting for some major prizes! This game is also available in a single and three payline version. Check out all three to become the sheriff in this lawless game and you'll be bringing in some major loot. The TNT acts as a scatter. Get three or more of these symbols anywhere on the board and you'll trigger up to 40 free spins. The sheriff's star acts as a wild symbol. It will replace all other symbols except the scatters and bonus symbol to help you create more winning combinations. If you spin the wanted poster on reels 2, 3 and 4 in a pay line, you will trigger a bonus game. You'll be prompted to pick from three boxes of bulltes to find out how many shots you'll get. You'll then have to shoot out several different targets, including bottles, pictures and flower pots, for a chance to win a mulitplier that will multilply your total bet.